ETC is located in the heart of the mountainous Marcellus and Utica Shales; that’s why ETC is the expert when it comes to manufacturing products that are built to last in rough terrain. Each piece of equipment that leaves our Johnstown, PA facility is designed by a robust team of engineers, manufactured by our highly trained and certified craftsmen, and tested by an objective, third party firm to ensure quality throughout the development process. ETC holds the safety of its customers as a top priority. Their industry certifications (ISO 9001:2015, ASME U Stamp, ASME S Stamp, and ASME R Stamp) show the unprecedented level of commitment ETC has in regards to both product quality and safety. ETC partners with their customers to design and manufacture products to provide customers their greatest return on investments. ETC’s current product list includes, AST’s, “Stadium AST,” “Stackable AST,” “Vertical Frac Tanks,” Vertical Mud Tanks, Flowback tanks, and ASME certified vessels. ETC understands that cookie-cutter products won’t bring value to their customers. That’s why our products are designed with features and options that continually help our customers optimize operations. 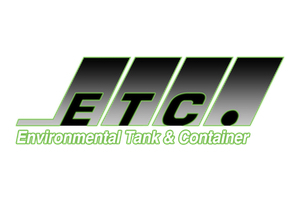 ETC is changing the way you store and move water in the oil and gas industry.